It's always so hard to tell what my Mom is thinking, especially when it comes to what she feeds me. Every day, I get the same food in my dish from the big bag. Sometimes the bag smells a little different and the food tastes a little different, but it is essentially the same kibbles. When the rest of my family eats, they sit in the special room and their food smells different every day! My boy always gives me some bites, so I know that some of it is wonderful and some of it, well, we're right back to wondering what Mom is thinking. That poor kid. Even if my dinner always tastes the same, at least it is edible! Mom used to bring home food for me and that cat from a special place. A big bag for me and a small bag for that cat. I don't think that cat likes her food very much because she never eats all of it. I've tried it a few times and it takes fine to me, but Mom wasn't very happy about that. Now, I wait until they are gone. I wouldn't want Moms feelings to be hurt because that cat isn't eating her food. The other day, my friend in the big noisy box came to the house. Usually, he just leaves little boxes at the front door. This time, he left a big bag of my kibbles and a smaller box! I really like that guy! Almost as much as the mailman who delivers my Milk-Bone® every day in the little box by the road. I was a bit concerned, though. Usually, when Mom brings home my bag of food, she has sweet little bags, too. Super yummy food that she puts way up high in the food room. They are sooooo good. I keep telling Mom and Dad and my boy, but I think they forget about it because it is up so high. I've tried everything to make them understand how much better the food in those little bags and boxes is, but, love them, they are a bit on the slow side. Usually I get one piece a day. I'll have to come up with a new plan because they think I'm trying to play some game with them; they always want me to do the craziest things before I can even get one piece! Bless that man with the big, noisy box, 'cause at least he understands! He left special boxes and bags with my big bag of kibbles! Oh, joy! 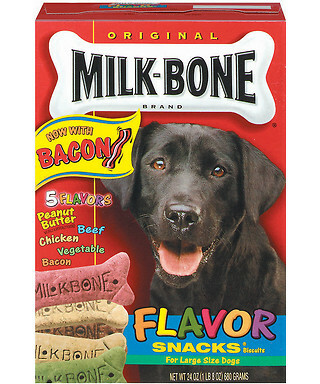 My favorite Milk-Bone biscuits (the mail man really got me hooked on those) and a new cheese flavored kind! Being the helpful kind of pooch I am, I tried to put them away for Mom, behind the couch so I could just help myself and she wouldn't have to worry about it. She didn't seem to catch on to the beauty of my plan because she found them and put them up high in the food room. Sigh. Mom and Dad were pretty excited about my friend putting them on the porch. I waited to try the new special food while they talked, and talked and talked. Two days! Great price! Huge variety! Free shipping! Mr.Chewy.com! Finally my boy came into the food room and gave me some pieces of the special food! Mom and Dad were still talking and smiling and waving some paper around. Gotta love that boy! Between you and me, he's the brightest one of the bunch! The special food was stupendous! I gave my boy a bunch of positive reinforcement for doing such a good job, and wouldn't you know, he got it! He gave me some more pieces before mean ol' Mom took the box and bag away. I'm a pretty easy going pooch; I don't care how my kibbles get to the house. Shhh...don't tell Mom, but I'm all for my friend bringing them, especially since he brings extra special food! 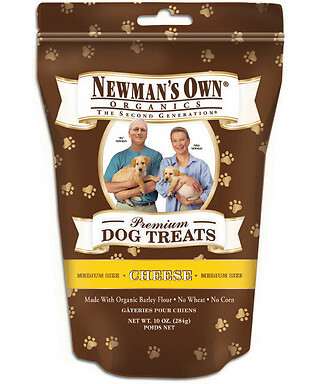 Mr.Chewy.com offers a tremendous selection of the brands pup parents want, from kibbles to treats and supplies, as well as products for cats. With the name brands you want, fast, free shipping on orders over $49 and everyday low prices that will certainly benefit your budget, this Puppy Mama highly recommends the convenience and savings of Mr.Chewy.com! 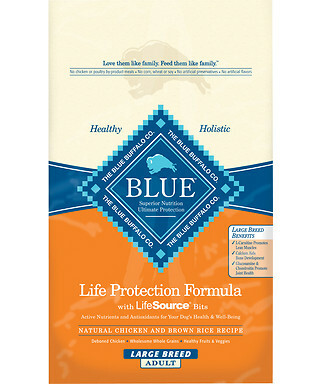 Our kibble staple, Blue Buffalo, is available in all our favorite varieties, as is Orijen and Taste of the Wild. We discovered treats galore at attractive prices, from our standard Milk-Bone biscuits, as well as new to us treats that were well received by our furry boy, like Neuman's Own Organics Cheese Formula. Our standard choices for felines were available as well, Science Diet Formula for Seniors and Nine Lives variety pack to keep our cranky old girl in good spirits. Ordering online at Mr.Chewy.com was simple and quick, as was the delivery service. With a large Lab in house, meeting the $49 threshold for free shipping was not an issue and our order arrived in two days, in excellent condition! This Mom loves the savings and convenience of ordering online, not having to wrestle with a 30 lb bag of dry dog food! We received product from Mr.Chewy.com to explore for the purposes of creating this review. The opinions and experiences above are both honest and our own. Images and information sourced from various Mr.Chewy sites. Pawprint Image. Poor Rex. Has to wait to get his food each day. Thank goodness for Mr. Chewy that delivers right to the door. Wow, my doggies would love delivery service ;.) I will have to check it out! I love Mr. Chewy. Great products and fast shipping! We don't have pets (except our new worms), but I LOVE not having to go to the store. As long as I can set a reminder to order on a set schedule, this would be awesome. You'll be hard pressed to run out of food when delivery is only 2 days. That's awesome! But funny post from the dog's perspective. Cute.